Landscaping is one of the most cost effective tools for improving and sustaining the quality of life; it is an integral part of our culture and plays an essential role in the quality of our environment, affecting our economic well-being and our physical and psychological health. It combines elements of art and science to create a functional, aesthetically pleasing extension of indoor living to the outdoor. The ECO GREEN Group represents a complete solution for all Contracting and Landscaping requirements with available expertise in all areas, from building, MEP, Aluminum Cladding and hard and soft landscaping to Irrigation, Waterscapes, Sports fields, Fencing, Timberworks and landscape lighting. We are a G+1 Dubai Municipality approved contractor having 10 years of successful service history delivering various projects in the government, semi-government, commercial and private sectors. 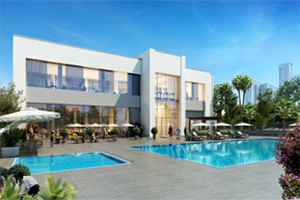 As we are a full solution company, we are able to exceed client expectations & requirements delivering all constructional components of building contracting from land preparation, structural works though MEP works to landscaping to give a final product with high quality on time delivering within a co-effective price. Our past experiences and current abilities to further within their trust and client satisfaction their exceed expectations meeting industry standards. 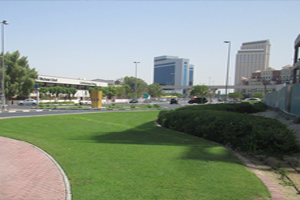 We are a Dubai municipality and RTA Approved Landscaping Contractor to having constructed many community parks in Dubai and many roadside landscaping projects. 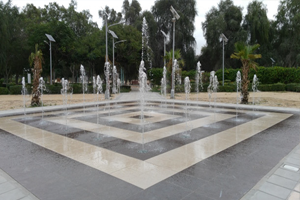 We have proven our valuable expertise in building any complex designs into fully functional living spares smoothly integrating various soft scape and hardscape components ensuring dusting trouble-free performance. We have a very quantitative approach to work as per industry standards using the best quality products and and work man ship to exceed client expectations & satisfaction. Following Hard & Soft Landscaping components. Garden structures & structure elements. Trees, Shrubs, Ground Covers, Seasonal Plants & Seasonal Flowers. Fence lighting & Pest Control. An automated irrigation system refers to the operation of the system with no or just a minimum of manual intervention beside the surveillance. Almost every system (drip, sprinkler, surface) can be automated with help of timers, sensors or computers or mechanical appliances. It makes the irrigation process more efficient and workers can concentrate on other important farming tasks. On the other hand, such a system can be expensive and very complex in its design and may needs experts to plan and implement it. Water is the crucial element required for the sustenance of every beautiful landscape. Eco Green Dubai specializes in the design and installation of automatic irrigation systems that will ensure the regular and accurate provision of water to your landscape. 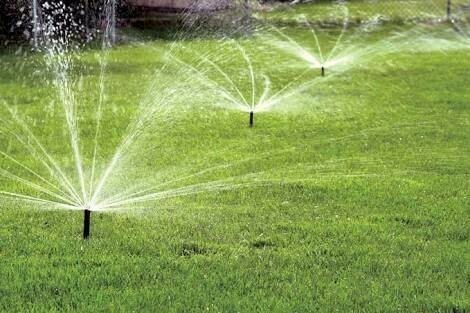 We employ the latest irrigation technology that is installed and commissioned by experts to help preserve your landscape’s natural radiance and beauty. The sound of running water can be very soothing. The expense and upkeep of a pond with a waterfall can be high. Maybe you just don’t have much room to work with. Garden water features or fountains can be a great alternative to your garden landscape plan. Eco green undertakes the engineering design and construction of decorative water features such as cascades, streams, lakes and fountains that will serve to accentuate the beauty of your landscape. In addition to water features, Eco green Dubai also specializes in the construction of customized swimming pools that comply with international standards. In landscape architecture and garden planning, Water features refer to fountains, pools, ponds, streams, waterfalls and cascaded. These uplift the beauty and smartness of a normal swimming pool. It adds a sense of class to the pool. Enhancement water features are included in our swimming pool design as per the tastes, requirements and the budget of our clients. We have qualified engineers who are skilled in the field of waters capes and will provide you with customized water zeatures and swimming pools that are best suited to your requirements. Timber structures serve to satisfy functional requirements such as decking, shade and seating whilst providing your landscape with an aesthetic appeal. Eco green caters to the engineering design and construction of a wide range of engineered timber structures including fences, railings, decking, pergolas, arbors and climbing frames. All materials used are of the highest quality and have been treated to ensure stability and durability. 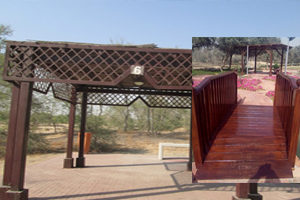 We ensure our timber structures can be enjoyed by all for many years to come. Engineered timber elements are used in today’s fast-growing methods of modern constructions. In many building projects, engineered timber elements are used which are environmentally sensitive, easy to use and cost-effective. These elements are specifically engineered to fix up the specific designing from industrial products to home construction and commercial buildings. We construct a wide variety of engineered timber elements that are made from lumber, veneers, and strands of wood. These elements are then bound together with structural resins forming the lumber-like structural goods. By using our engineered timber elements, you will get many environmental benefits throughout the completion of the construction process. 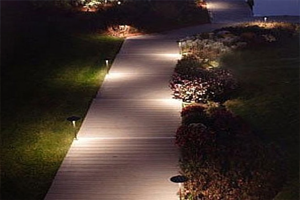 Landscape lighting systems are provided to illuminate and enhance the beauty of the landscape in the night. Eco green specializes in the implementation of dynamic and efficient lighting systems that will enliven your landscape into an area of spectacular beauty. A variety of lights can be used to accentuate trees and highlight features such as swimming pools, fountains, gazebos, patios, and plants. Eco green uses the latest technology to implement landscape lighting systems of the highest quality that will best complement the beauty of your landscape. Landscape maintenance is the critical vocation of preserving the health, safety, cleanliness and beauty of a landscape. Maintenance protocols may include the pruning of plants, weed control, administration of fertilizers and pesticides, and mowing of lawns. Eco green offers customized maintenance packages that are tailored to suit our clients’ individual landscaping requirements. We provide a big team of landscape maintenance service that are probably required for every business and organization because they want their landscape keep as it is for a long period of time. 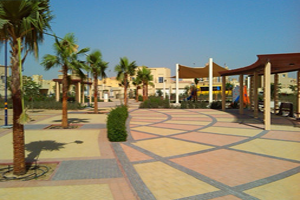 If you are looking for the right landscape maintenance professionals then always come to us. We provide you reliability and guaranteed work according to your choice and requirements that suits you due to having great knowledge about the maintenance of landscape. On the other hand, if you do not want services from us then we can also give you an option of taking advice and suggestion from us. We can keep you under our instruction and thus you will gradually learn how to maintain your landscape properly. We always help you to assist better. Eco green offers a wide range of garden furniture and accessories such as parasols, benches, lounges, planters, bollards and bird baths, from world-renowned manufacturers. Our garden furniture will complement the beauty of your landscape whilst allowing those who enjoy nature to experience the outdoors with comfort and ease. The people who are keen to have these outdoor furniture facilities and want to enjoy their morning tea with the newspaper in one hand sitting in a garden designed by outdoor furniture. We are here to help www.ecogreendubai.com them in providing a big collection of outdoor furniture according to your choice. We have a vast collection in which you can select that you like the most for making the luxurious garden. The quality of our furniture is durable and guarantees you to keep as it is for a long period of time. 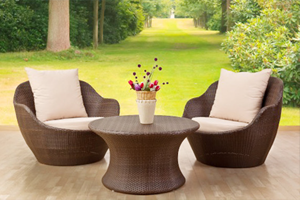 We are proud to serve you with the best service of providing outdoor furniture with a wide range of old dated and modern garden furniture with the advice of our expert and customer care.